Breakfast hasn't always been my favourite part of the day. I've told you that before right? Well, it is now, especially on a weekday. Whilst the day starts early and hurriedly for me, breakfast comes after the kids are in school. They're comfortable and laid-back. Almost lazy. It's the time I look forward to leisurely talks with Akber, my favourite way to spend time together. It's our time to reflect on the day before, make plans for the day to come, be together. Talk work, talk without being interrupted, actually finish a sentence. You're nodding your head in agreement, yes? The only quiet time where Maryam isn't telling me step by step instructions on how create the perfect crown to wear to her birthday party this Thursday. Or Hassan trying to eat what he calls Mummy's 'um um'- i.e. Mummy's breakfast. He seems to have a habit of eating multiple breakfasts. One on his own, one with mummy, one with papa and one with the nanny. Breakfast is when I get time to linger around the table, make feasts, have a moment to catch up on my favourite reads. It's also when I can make something for myself, without having to worry about who doesn't eat what and who will moan about what. Usually something sweet for me and eggs for him. When I say sweet, it could be just a muffin or perhaps a smoothie. Maybe even pancakes. 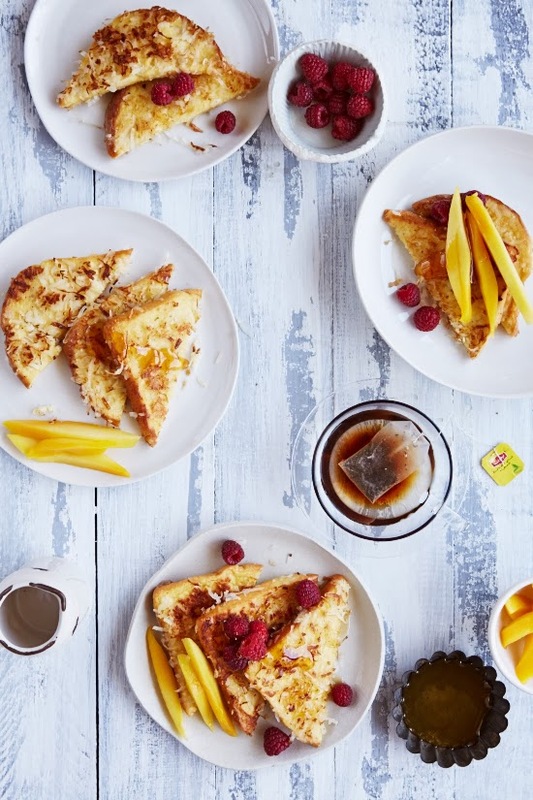 For today, it was these coconut French toasts. I urge you to make them. So leisurely, so decadent. In a shallow pie pan or bowl, whisk together the cream, milk, eggs, vanilla extract and nutmeg. Heat a frying pan on low to medium heat. Use a stick of butter to coat the base of the pan lightly. Dredge the brioche slices in the custard, allowing excess to drip off. Coat both sides with the coconut flakes and place on the frying pan. Allow to cook for 2 minutes or until the bottom is golden. I found low heat works best so that the egg mixture is cooked but the flakes don't burn. Flip over cook the other side until golden. When the bread is pressed in the centre, it shouldn't be soggy. Repeat until all the brioche is cooked. Serve warm with fruit and a small drizzle of maple syrup. Note- I used ready sweetened coconut flakes. If you are using the unsweetened variety, make sure to add caster sugar to your custard mixture one tablespoon at a time until it's sweetened to your liking. I found about 2 tablespoons was right for me. Exquisite and extremely tempting! This is a wonderful idea. This breakfast looks like a dream! May I ask, please, what is double cream? Love the set up of this pic - the sense of sharing. 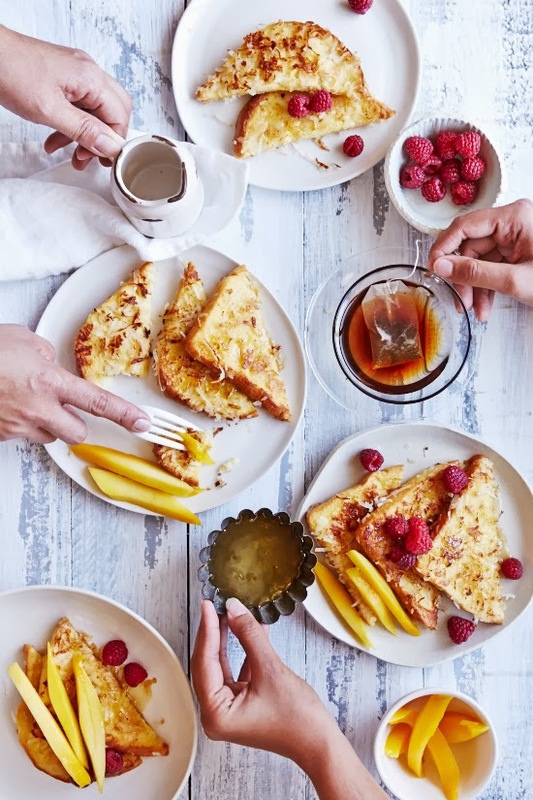 In love with these photos, and this is my kind of breakfast! i really need to make more time for myself in the morning. this french toast will definitely be delightful. 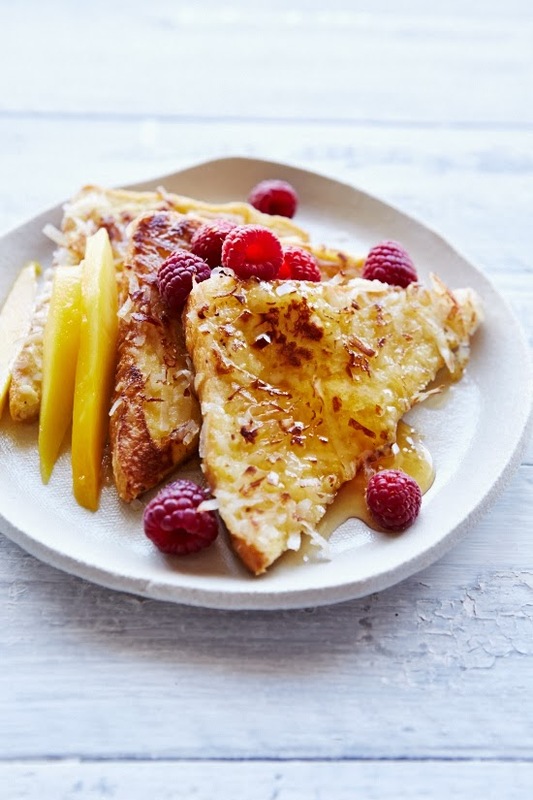 Coconut and french toast...my kind of breakfast! Pinned! This looks like the perfect weekend brekky. Anything that involves both coconut and raspberries wins me over! I've just pined your photo, it looks so yummy! That is just totally awesome Sukaina! Loving those photos!! 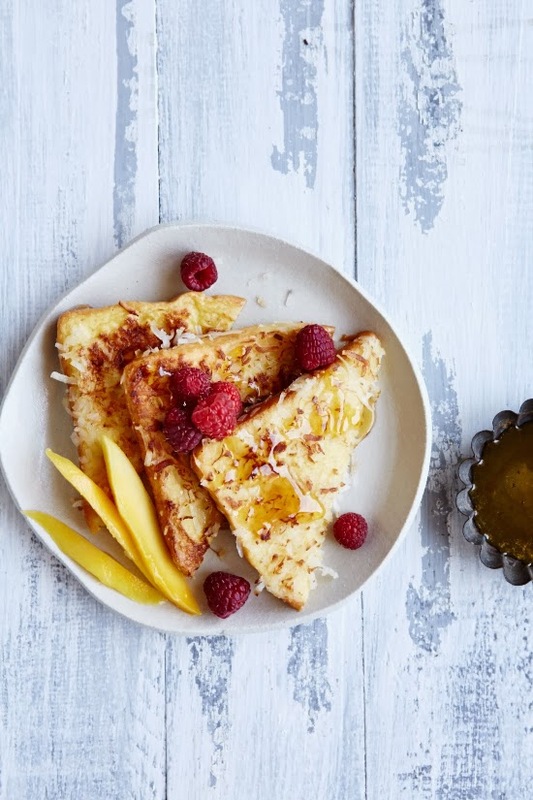 French Toast and coconut seem like an awesome combination. your french toast looks delicious! great pictures. Combinació crítica de coneixements que inclou la concepció creativa i habilitats tècniques i interactius i disseny li permetrà mantenir el seu lloc web amb eficàcia. [URL=http://saitv.3dn.ru/] http://saitv.3dn.ru/ [/URL] tecnologia d'Internet no es queda quiet, el canvi dels motors de recerca de feina, la millora del mètode dels llocs de mostreig en els resultats de cerca. Shopping online is safe and comfortable on the MMI - complement the needs of your phone spare parts. articles were very interesting and very useful. thanks. Jual beli online online mudah dan terpercaya dari Siti Yanis di Bukalapak. Alat reparasi Hp menyediakan alat-alat servis handphone dan elektronik no.1. It is your colourful blog that brings me a lot of knowledge about living. This site is one of the best I have found. Is likely to appreciate it for those who add forums or anything, web site theme . very useful and easy to understand sentences. thanks. good Tv set Displays within your gizmo without forking over anything. guide from showboxdownloadz Persons who will be puzzling to discover setup apps, ShowBox Free nice. I think this is a real great blog post. good The central personality of game that time was trainer named Red. guide from pokemongodownloadi enjoy the new augmented reality video game called Pokemon Go on your mobile. Pokemon GO Free great. The Pangu is a Chinese programming team in the iOS community that developed the Pangu jailbreaking tools.These are tools that assist users in bypassing device restrictions and enabling root access to the iOS operating system.This permits the user to install applications and customizations typically unavailable through the official iOS App Store. Now to get Pangu Jailbreaking tools are so easy or free from CydiaNerd you can get Latest Pangu iOS 10 Jailbreak. Dimensione: 16, 18, 20, 22, 24, 26, 28. Materiale di superficie: Tessuto 100% poliestere. good the hands, but nonetheless displays off the bride’s dazzling smile. Wedding Photography in Ahmedabad | Wedding Photography in Vadodara | Wedding Photography in Surat the wedding party working day that you as the photographer must recognize and get. nice. This Fan Banner for the New Orleans Saint Fan is a great way to show the neighbors who you're rooting for on gameday! This pleated fan bunting is made of 100% nylon, measures a 27"x57" in size, and has three metal grommets along the top header for easy hanging. good video clips on numerous social networks sites like http://peggoapp.com/ Program HD video or full-resolution HD Compact size, not nice. Looks very delicious! If I could make it myself to serve the family meal, then everyone in my family would be surprised! Can I view this as a work of art? Great ceativity and the post clarity is awesome! I hope you will continue to have such articles to share with everyone!